Published: May 26, 2016 at 03:02 p.m. Updated: May 26, 2016 at 03:22 p.m.
College Football 24/7's "16 for '16" series continues with a look at 16 of the game's most freakish athletes. There are far more than 16 who qualify, of course, and they can come in the form of the small, electrifying skill player or an incredibly powerful lineman. We've chosen a mix of stars and underrated players from a wide variety of schools whose freakish athletic ability is highly intriguing. Is there anything this guy can't do? 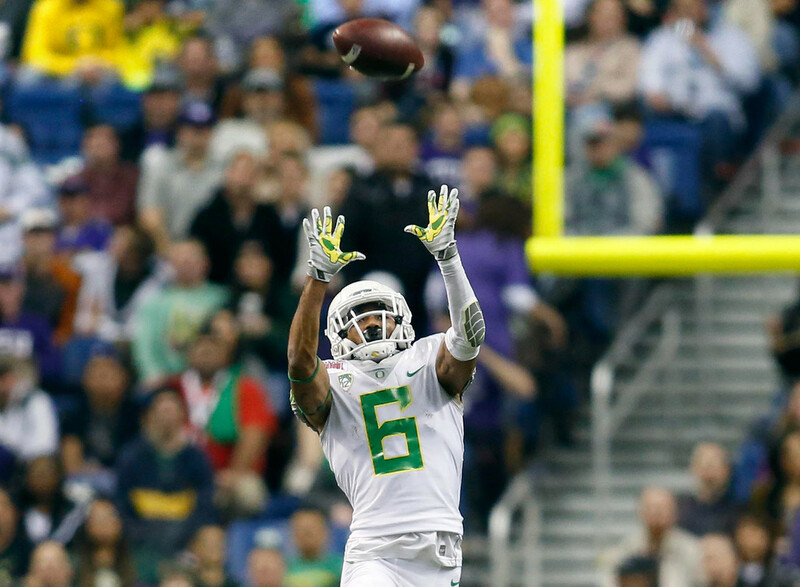 Nelson started three games at receiver last year for the Ducks, then flipped to defense for eight starts at cornerback. All the while, he served as a dangerous kickoff returner (just ask Arizona State). Add to that, he's a member of the UO track squad and was part of an All-American 4x100-meter relay team as a freshman. His 40-yard dash was reportedly clocked at 4.39 at a University of Florida camp during his recruitment. Expectations in Lubbock are that Willies will emerge from relative obscurity this year as a spectacularly athletic weapon for QB Patrick Mahomes. You want a unique social media credential? How about a 60-inch box jump, from a sitting position, while wearing a 10-pound vest. On the field, Willies, who began his career at Iowa, led all JuCo receivers last year in yards per catch at 23.6 while at Trinity Valley Community College. Despite never having played a down for the Red Raiders, the Dallas Morning News ranked him as one of the top 10 players on the roster. McGlinchey, who will make the move from right tackle to left tackle for the Fighting Irish this year in replacing first-round pick Ronnie Stanley, reportedly played every position on the field except in the secondary at the high school level. He's also regarded as the best basketball player on the Fighting Irish football team, a distinction few offensive linemen could claim. A cousin of Atlanta Falcons QB Matt Ryan, McGlinchey recounted a story for the Chicago Tribune of a pickup basketball game against Ryan: "... I dunked on his head. That's my glory right now." Echols-Luper is a two-timer on CFB 24/7's preseason list of freakish athletes, having made the cut a year ago while at TCU. His track accomplishments there were prolific, most notably winning the Big 12 indoor long jump title. He hasn't been heard from in a while due to a transfer to Arkansas State that forced him to sit out a year under NCAA rules. But ready yourself for his re-emergence; he gave Red Wolves fans a taste of what's to come with a 92-yard kickoff return for a touchdown in the ASU spring game. A small-sized addition to CFB 24/7's list of freak athletes this year, Moore brings amazing open-field ability to the Falcons. He's stronger than he looks, to be sure, bench pressing 300-plus pounds with a squat max of more than 500. Bowling Green played three Power Five schools last year -- Tennessee, Maryland and Purdue -- and Moore showed well against them all (combined 22-248-1). He caught 72 passes for the year, and with WR Gehrig Dieter transferring to Alabama, Moore will be counted on even more this fall. With just eight career starts to his credit, Bryant is more of a budding star than an established one. But his athleticism isn't questioned anywhere in the MSU locker room. The Bulldogs have timed Bryant at 4.24 in the 40-yard dash, the same time Chris Johnson recorded to set an NFL Scouting Combine record. He can bench press 385 pounds and deadlift 600. A former high school and MSU teammate of Houston Texans LB Benardrick McKinney, Bryant closed his freshman year with an interception of New England Patriots draftee Jacoby Brissett in the Belk Bowl. The Aggies' leading rusher from last season has remarkable explosiveness, evidenced by a 41-inch vertical jump that would have ranked second among all running backs at this year's NFL Scouting Combine. He can bench press 425 pounds and squat 515; that's 940 pounds total, more than four times his weight. Mays piled up 966 yards last season in just 165 carries (5.9 per carry). With USU returning its center and both offensive tackles, Mays figures to crack the 1,000-yard mark this fall. The Hilltoppers star can broad jump 137 inches, which would have been the best broad jump of anyone at the 2016 NFL Scouting Combine. He's also been clocked at 4.33 in the 40-yard dash and can vertical jump 39 1/2 inches. On the field, he all but set WKU's record book on fire last year, setting new single-season school marks for receiving yards (1,467), catches (86) and TD catches (17), along with several career records as well. Against the stiffest competition on the schedule, LSU, he caught 10 passes for 103 yards and a score. Meet the new Jalen Ramsey of the FSU secondary. No, James isn't a cornerback, so there's one key difference between the No. 5 overall pick of the 2016 draft and the Seminoles' rising sophomore. But make no mistake: after just one year in the FSU secondary, James will be counted on as the unit's playmaker and leader this fall. He's crazy strong for his size with a bench press of more than 400 pounds. A cousin of former Indianapolis Colts star RB Edgerrin James, Derwin can leap human beings in a single bound. At a massive size for his position, Hurd has nimble footwork and changes directions like a much smaller back when necessary. In the weight room, he can squat over 600 pounds. Then there is his speed, which he documented here via Instagram. After picking up 1,288 yards last year, he's the safest bet to lead the SEC East in rushing this fall. After being recruited as a defensive back, the Wolverines' most dynamic player has developed into much more. He saw action on both sides of the ball last year, and might just end up at linebacker this fall. How many college linebackers can say they won state titles in the 100- and 200-meter sprint events in high school, as Peppers did? He also returns kickoffs (27.9 average) and punts (11.4 average) for the Wolverines. His versatility has led coach Jim Harbaugh to say Peppers could be the "Willie Mays of college football". Second-year coach Tom Herman, who coached his share of premiere athletes at Ohio State as offensive coordinator, reportedly called Ward "a poor man's Braxton Miller." He might be well short of Miller when it comes to size, but with 4.3 speed in the 40-yard dash and dazzling rushing skills as a dual-threat quarterback, Ward is a very Miller-like player for the Cougars. With a healthy season, Ward figures to exceed 1,000 yards both passing and rushing for the second consecutive season this fall. Ask any number of Sooners players who among them impresses most in the weight room, and fingers will point to Perine. Among the testimony, from LB Jordan Evans, is that he repped 275 pounds on the bench press 20-plus times ... as a freshman. He can also broad jump more than 10 feet and his 40-yard dash is in the 4.5 range, according to coach Bob Stoops. It's no wonder he's rushed for more than 3,000 yards over his first two seasons at OU. Fournette doesn't need to prove himself in the weight room or on a track to qualify as a freak athlete -- he only needs an audience on Saturdays. There isn't a more impressive combination of power (600-pound squat) and speed (4.35 40) at his position anywhere in the game. While this video illustration can't be called a 40-yard dash, it certainly proves he can fly for his size. If Fournette eclipses his freshman season total of 1,034 yards this fall, he'll have posted three of LSU's top 15 rushing seasons ever in his first three years at the school. If a dynamic two-way player who can also return kicks for one of the top programs in the country doesn't qualify as a freak athlete, nobody does. Throw in Jackson's track resume, which includes a pair of Pac-12 long jump titles and a 100-meter dash time of 10.38, and he's in a different class as a two-sport athlete. Coach Clay Helton excused Jackson from spring practice to pursue a spot in the Rio Olympics. Named the Trojans' football MVP in 2015, he'll again be primarily a cornerback this fall, plus return duties and a part-time role on offense. Is there a bigger man in college football who can break 4.5 in the 40-yard dash? Prior to last season, Garrett reportedly did just that, along with a 38 1/2-inch vertical jump and a broad jump of 129 1/2 inches. Whether the Aggies star is draft-eligible in 2017 or 2018, his athleticism and combine testing as a defensive end will generate a scouting buzz on a level with 2014 No. 1 overall pick Jadeveon Clowney.